The Skinny: One year after the runaway success of Shirithe South Korean blockbuster that sunk Titanic and reduced the North/South conflict into a cheesy straight-to-video populist popcorn flickJSA calls upon its South Korean audience to re-examine their dubious neighbors to the north. A single gunshot rings out and punctures a window in the sole North Korean outpost next to the Bridge of No Return on a chilly October morning. Several more shots are fired and moments later a South Korean soldier emerges only to collapse on the historic bridge as a small firefight breaks out between both countries around him. Though this latest incident of hostilities has put further strain on North/South relations, both countries agree to an investigation by the Neutral Nations Supervisory Commission, a European venture between Switzerland and Sweden dedicated to disarming such ticking time bombs without taking sides. The NNSC dispatches two Swiss military detectives: one an intuitive Swiss-Korean, Maj. Sophie E. Jean (Lee Young-Ae, heard a quarter of the time in ADR testing out her English) the other a milquetoast soldier (Herbert Ulrich). When they arrive at the DMZ, their superior proffers this symbol for the Korean peninsula: a dry forest that could go up in flames with the induction of a single spark. Both North and South Korea are represented during the investigatrion by their military regimes, each radiating the usual stereotypes. Early on, a South Korean general scoffs at the investigators' neutrality, proclaiming there are only two types of people in this world: commie bastards and their enemies. When Maj. Jean visits North Korea they take her to the autopsy of the two soldiers murdered in the incident and make pointed note of the grieving wife and young daughter of one of the victims. The killer is supposedly a cold-blooded capitalist puppet, who they are certain was following the orders of his superiors. Through two brief Rashomon-style flashbacks both sides present their case. Despite his instance that he crossed over to North Korea voluntarily via the Bridge of No Return, South Korean officials believe Sgt. Lee Soo-Hyuk (popular television star Lee Byun-Hun seen here with the perpetual thousand-yard stare) was kidnapped by two North Korean soldiers and dragged back to their outpost, whereupon he managed to narrowly escape with his life. On the other hand, North Korea maintains that Sgt. Lee deliberately snuck across the bridge with malcious intent, opening fire inside the outpost, shooting two of the three soldiers execution style, and wounding the third, a sergeant portrayed by the always great Song Kang-Ho, whose beady eyes and tightly coiled lips match his olive green uniform. Even though we know there is little truth to either biased flashback, circumstantial evidence supports the North's case. 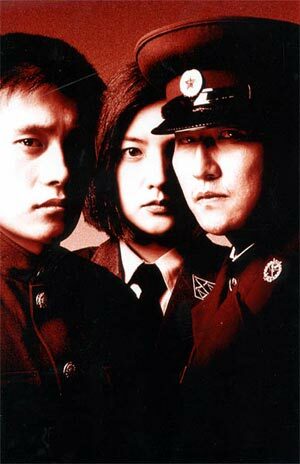 And so the film's only revealing flashback begins, spearheaded by Maj. Jean's discovery of discrepancies in bullet wounds versus bullets recovered and a suicide attempt on the southern end of Joint Security Areaan unarmed, unfortified segregated outpost shared by both North and South Korea in the DMZ.